With over 15 years of tried and true results, the Quickie® TS features traditional tilt-in-space technology and a comprehensive mix of positioning options designed to provide the optimal position for adults. The Quickie TS features traditional tilt technology, meaning the tilt action occurs at a fixed pivot point. Optional locking gas springs or lever-activated dual mechanical locks allow for infinite tilt-in-space positioning. Aside from the standard frame with a 250 lb. weight capacity, the TS is available in four additional frame types. 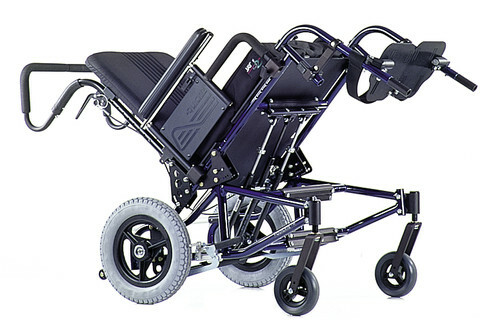 The growing frame accommodates user growth, the contracture and flared frames are ideal for special positioning needs, and the heavy duty frame suits those weighing between 250 and 350 lbs. For users who benefit from an open back angle, the Quickie TS is also available with 60° of manual recline. User Weight Capacity Standard: 250 lbs. Front Seat-to-Floor Height 16.50" to 20.75"
Rear Seat-to-Floor Height 16.50" to 20.75"